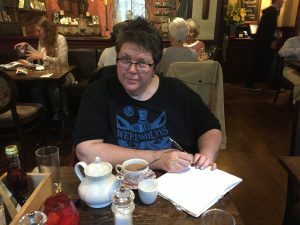 I hit the ground running on my first day in London, what with the Britmovietours Sherlock Holmes walk and the much less strenuous delights of staying in the Langham Hotel. My second day in London, “that great cesspool into which all the loungers and idlers of the Empire are irresistibly drained” was spent even more energetically. “I am the most incurably lazy devil that ever stood in shoe leather—that is, when the fit is on me, for I can be spry enough at times” ~ Sherlock Holmes, A Study in Scarlet. I hesitate to say I was spry at all, but I was far from lazy. I’d always assumed the famous waxworks museum would be cheesy though slickly presented. I wasn’t especially tempted to visit, although I’ve been fascinated to read about the history of waxwork models and their role in studying anatomy through the publications of the now-defunct Morbid Anatomy Museum. 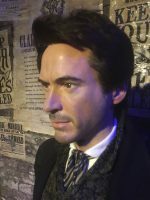 A visit to Madame Tussaud’s was on the cards, though, because of its Sherlock Holmes Experience theatrical event. And also because it houses a couple of Sherlock Holmeses! The waxworks is every bit as cheesy as I’d expected, and also very slick – and a huge amount of fun. It’s a curious collision of the historical and the new, because Madame Tussaud originally made her waxworks of famous figures in the late 18th century. Here we are in the 21st with essentially the same technology and the same purpose – but now we can take selfies with our celebrity substitutes. Knowing they’re wax replicas doesn’t diminish the fun. In fact, if you’re a Doctor Who fan, you can imagine them all as Autons about to come to life and the fun just doubles. 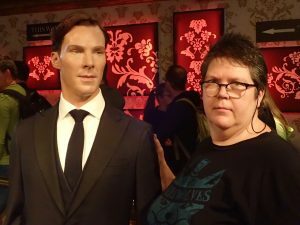 Naturally I had photos taken with a few of my favourite historical and theatrical faves: William Shakespeare, Freddy Mercury, Helen Mirren and Benedict Cumberbatch. It’s a labryinth inside, but eventually we came across the entry to the Sherlock Holmes Experience. Robert Downey Junior’s Sherlock stood sentry in the chamber, designed to look like a Victorian London Street. 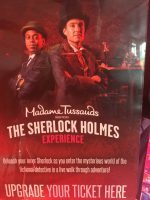 The Experience is a bit of a mixed bag – the Baker Street set is good fun, and Mrs Hudson’s greeting and explanation of the puzzle is full of pizzazz. It’s fun to be sent through doors and find yourself at the docks, the morgue and other locales. The final part of the story gallops a bit quickly to a close and feels like it runs out of puff. But never mind: the crypt in which you find yourself is full of headstones with fabulously silly puns which you’ll get if you know your Conan Doyle canon. Not content with punishing the shoe leather as mentioned, Tim and I went on to join the regular Friday afternoon Sherlock Holmes’s London tour run by London Walks. 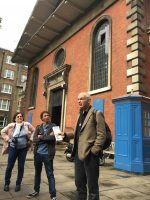 Our guide was Richard (the Fourth of his name at the company) who was led us on our two-hour tour with its focus on Arthur Conan Doyle’s life and inspirations in London as well as locations from the 60 Sherlock Holmes stories he gave us. Richard not only knows his ACD and Sherlock Holmes stuff, he speaks with warmth and wit. On the rare occasions this walk overlapped with the Britmovietour’s, Richard provided different anecdotes, so nothing is lost by going on both walks. If you’re more a fan of the original stories than the various film versions, this is probably the walk for you, as it winds around places where Conan Doyle lived or visited as well as locations he used or was inspired by in creating his iconic characters. In any case, for £10 it’s a great look at London and Sherlock Holmes, set at a pace that even Mycroft might easily manage, let alone Sherlock on a lazy day. I have no secrets from Sherlock Holmes: Tim Richards and I are being hosted on this trip by VisitBritain. While you’re in a Sherlockian mood, you might like to read my Holmes ♥ Watson novel The Adventure of the Colonial Boy, or a traditional Holmes + Watson short story. 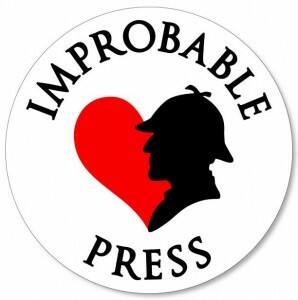 Speaking of which, my Holmes + Watson story The Problem of the Three Journals, an alternative universe tale of Holmes and Watson as a pair of Melbourne hipsters who run a cafe and solve mysteries, will appear in Baker Street Irregulars 2: The Game is Afoot in 2018. You can pre-order your copy now!